The Philadelphia City Planning Commission is partnering with the Citizens Planning Institute to offer city residents the opportunity to speak their minds on the Philly's updated zoning policy. 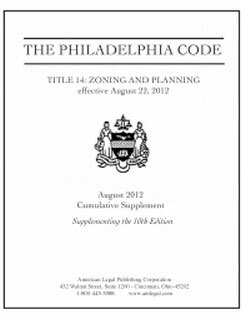 Designed to solicit input on the zoning code updates enacted in August, 2012, these meetings will address the pros and cons of current zoning policy in an effort to create an increasingly usable, helpful, and respected process for Philadelphia citizens. Community members, developers, design professionals, attorneys, and anyone with direct experience working with the new zoning code over the past year are highly encouraged to attend one of the feedback meetings scheduled between June 5 and June 21 at the Philadelphia City Planning Commission Office. The first public meeting on June 5 will focus on input from registered community organizations or “RCOs.”Individuals interested in attending one of the six sessions are required to R.S.V.P. Space is limited to ensure that all voices are heard and registration closes 48 hours prior to each event's start date. Residents who are unable to attend the sessions should provide their feedback through an online survey available from June 12-24.